Enthusiastic volunteers gathered on Saturday morning, August 11, 2017 for the Suncoast Reef Rovers annual underwater clean-up of the Venice North Jetty, a popular fishing spot. A combination of 19 SCUBA divers, 19 ‘topsider’ helpers, one kayaker, one snorkeler, and one Sarasota County Sheriffs police boat worked for a few hours to rid the underwater habitat of abandoned fishing gear. 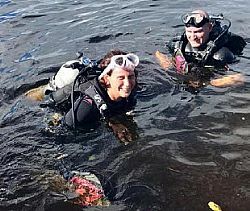 Sarasota Bay Watch partnered with the Reef Rovers to help gather volunteers, sort debris, and gather data. The EPA donated sturdy dive bags and ReelCycle partnered to ensure best practices for waste disposal. NAUI Green Diver Initiative was also on hand.